This is a political attack on immigrants in this state, particularly undocumented families, for votes. Its is shameful and must stop. Under this bill police are required to determine and report the immigration status of every arrest when there is “reasonable cause to believe” that person is undocumented. Racial profiling is foundational to this bill. Undermines police departments across the state working to build trust and relationships with communities at a critical time in police-community relations. It will be counter-active to local public safety measures. Denies municipalities’ autonomy to make agreements that protect victims and witnesses from being probed about immigration status when contacting the police. Requires that any municipal employee not be denied the ability to inquire and report the immigration status of any individual. This would make every municipal building including our schools, traffic courts and health clinics sites where immigrants can be harassed by any employee without protection from their towns and cities. There are 32 Counties in PA that have some type of policy restricting access of ICE to people in police custody. 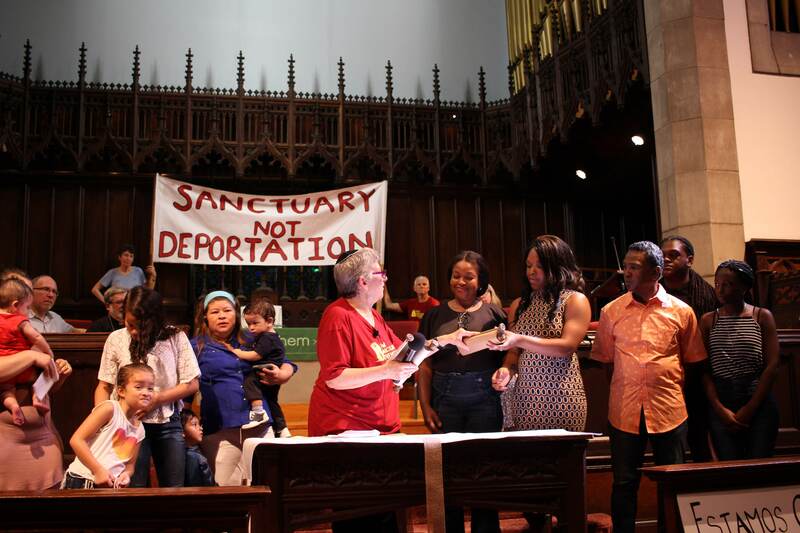 Sanctuary Cities have a tremendous impact on the immigrant community and the state as a whole. They have reduced deportations, kept families together, created safer cities and towns and helped Philly grow and thrive. On Friday, Oct 21st, we held a ritual for Sukkot and All Night Vigil to take a strong stand against HB 1885. During the Jewish holiday of Sukkot, we built a Sukkah and held a ritual to remind PA State Senators about the ancient values of hospitality and inclusion. Then from 7pm to 7am, we held an all night prayer vigil outside during a cold, rainy and windy night. Teams from different congregations brought prayers, songs and rituals throughout the night in order to send a firm message to PA State Senators to vote against this bill and for Governor Wolf to veto it. On Monday, Oct 24th, we worked with other groups to deliver a faith letter in opposition to HB 1885 signed by over 200 faith leaders across the state. Call your State Senator and Governor Wolf: Republican leadership is pushing for a veto-proof majority, so we really need our Senators to hear from each and every one of you. Tell your Senator to vote no on HB 1885, the Anti-Sanctuary Bill. You can find your State Senator here. Then please call Governor Wolf at 717-787-2500 and tell him to veto the bill.